Kevin, whatever method you use to cut rails, run a small file over all 4 sides to remove any burrs no matter how small they are. I do assume that the rails did not alter from being level after you cut them? And how wide is the gap after you cut the rail - about 1-2 mm or 1/16th maximum ? I always use a Dremel Kevin with a thin circular slitting saw works best if the track is not in place if its fixed down you cant do it squarely and get a perfect joint but to be fair its pretty good fit as you only talking a slight angle on a rail that is only a few millimeters thick plus the the dremel is good for taking of that extra 1-2 mm you made need to remove. If you're getting a "bump" then I'd be inclined to check the board alignment, pattern makers dowels are probably the best things to use, available on Ebay , Eileens Emporium and others. Dremel with a 90 degree head attachment and a thin cut-off disc. John (brossard) has a useful tip, lay flex track across the gap, cut, move the rails in to the desired gap, fix ends using copper clad or the heads of brass screws or good old epoxy. Hi Nigel. Thank you . When you say “ Fix ends “ and “ Or good old epoxy “ does that mean you don’t prefer solder?I have already soldered the rails directly to the screws, but, of course if this fails I am open to all polite suggestions. Copper clad always sounds like a good solution until the copper delaminates. I have had this happen when using Xurons. Best to do the last 2-4 sleepers with copper clad, not just the last one, and avoid Xurons. The torque generated will flex and buckle track. There are some neat commercial copper clad ties/sleepers available for HO that I have used with great success. $$$ though. 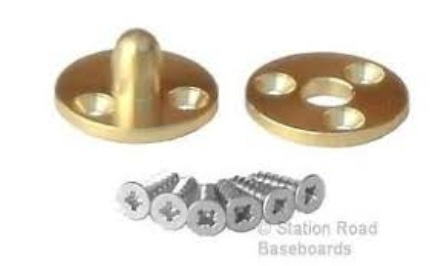 Brass cheese head screws are robust, the height can be adjusted, but the last sleeper will need patching in. The down side can be the smaller contact area compared with copper clad. Epoxy used for gluing the last few sleepers and the rails to the chairs is more robust than pva or CA. The underside of the sleepers needs keying. The weak link is the chairs. Code 100 HO/OO chairs are robust tabs, once you get down to code 83 or 75 not so. A knock is more likely to displace the rail than the sleeper unless soldered or spiked. As long as the sleepers are firmly attached rail spikes at the ends work well. Most modular systems use removable sections of track, anything from 2" to 8" long. Weak link is the relatively loose rail joiners. Long sections need a power supply. The gap left by a cut-off disc does not affect running. What do I do now? For straight track, to the edge then back a tad so when the board is stood on edge the rail is not quite in contact with the floor. Think paper sheet thickness. Two copper clad ties on each side epoxyded to a piece of wood glued to the top, not to the cork underlay. I use single sided copper clad and rough up the bottom with # 80 paper. Rail spikes just in case (drill holes and epoxy). For curves I lay the track over the joint, solder to the attached copper clad, then cut with the Dremel. Most modular standards do not allow curves within 6" of the edge, and I try and avoid them at home. Most copper clad is thinner than regular ties/sleepers, I use wood glued to the baseboard not the underlay to get the correct height. Modules that travel need protection, I use a piece of thick corrugated cardboard taped over the ends. You can avoid all of this by using track sections over the joint. Especially in fiddle yards where you do not need gravel. just use what works best for you. We all have our own pet schemes. Hi Nigel. Thank you. My first attempt was copper clad, using a new ish Antex 25 watt iron. Then I made a “ Big “ mistake, I arttempted to cut the track with a Zona Razor Saw , wrong, the track went every which way as much as I don’t want to purchase a Dremel for one job, it looks as though I must bite the bullet, My second attempt with brass screws didn’t go any better. At a recent model railway show, I visited the “ C & L stand “ to get a supply of their copper clad sleeper, but the isolation gap was too wide for my liking Best wishes. Kevin. PS recommendations required. I have a Dremel and use it often for a variety of tasks, even some model railway related. Please think very careful before you buy one as they can be very dangerous. They can tend to run away from the wary and spin at very high speeds, therefore they must be treated with great respect and a reasonable amount of skill to avoid a trip to A&E. You also need a firm and very steady hand, otherwise the workpiece and operator are both in danger. Dremels were not around when we all first started in model railways. In those days, I used a junior hacksaw and needle file to great effect and still do. I would recommend you try one again on your track before spending money on something you may find bites you! Before hacksawing, clamp the track in a home made clamp before you cut it. My clamp was made with an offcut of timber batten about 2'' x 2'' x 3''. Cut with two shallow cuts with the hacksaw (or tenon saw for greater accuracy) across the width of the block, to hold the two rails down. Fit it over the track, press down with left hand, cut the track with the right, using the edge of the clamp as a guide. Be safe and enjoy modelling at you own pace. Bill is right, a Dremel is not for the faint hearted. Tidy workpkace, eye protection, work gloves. the disc/blade/bit in the pointy end is at 8000-36000 rpm. That said, I use mine for everything. A piercing saw with metal blade works fine on nickel silver rail, which is just a fancy name for a brass alloy. I use one for the places where the Dremel will not go. You can always use the Xurons (eye protection), cut slightly over long, then solder, file gently as required. Less noise and happy neighbors. Every modeller will have their preferred preference when it comes to bridging the gap. What works for some will not work for others. This could be down to a lack of or different tools available. I would say that it would be best to bridge the gap with straight track if you can. That said I have 4 areas on my layout with gaps - needs must for access and window maintenance. Some have a slight curvature and some also have point work. My preferred method is brass screws to which the track can be soldered to and the use of a thin disc in a Dremel. Works for me but that said, no matter how accurate you may be with your alignment, sods law will dictate that there will be a slight rise after you have made the cut. Get the file out or try and live with it. If it doesn't derail your stock then it may just be worth while living with it.